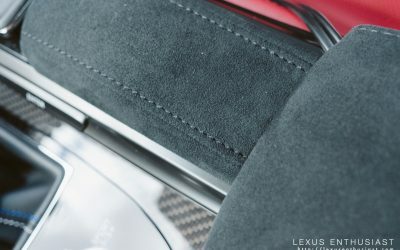 When the fourth-generation GS 350 was introduced at Pebble Beach in the summer of 2011, it marked a turning point for Lexus. 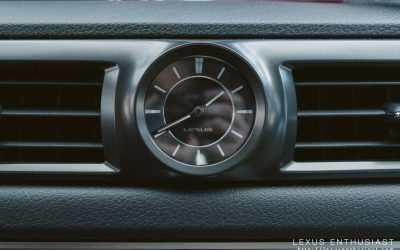 This was the first model to wear the spindle grille, the first move toward performance as a core attribute of Lexus models, the first step in a direction that would transform the brand. 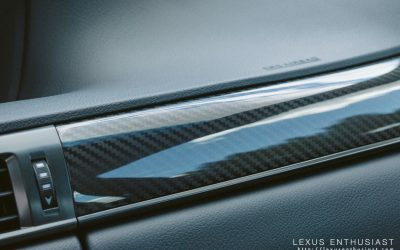 Four years later, Lexus has introduced the GS F — a high-powered variant that combines the standard model with all the performance enhancements recently introduced in the RC F coupe. 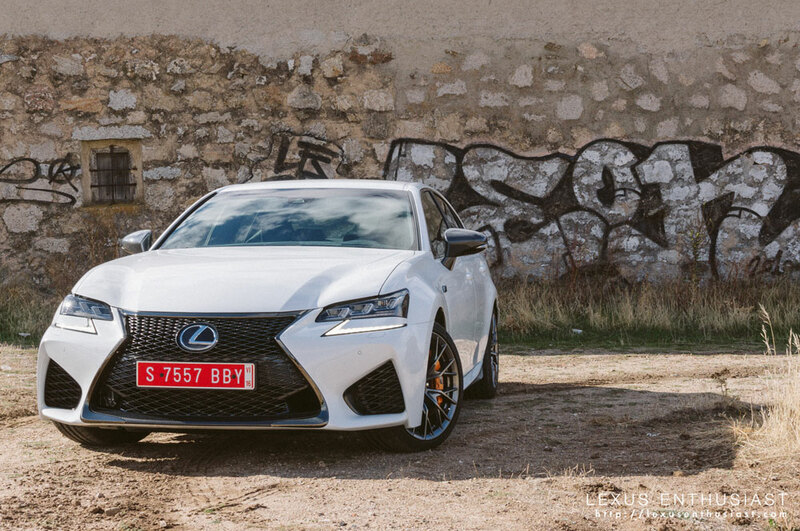 But is this nothing more than a GS with the RC F engine, or is it something else entirely? 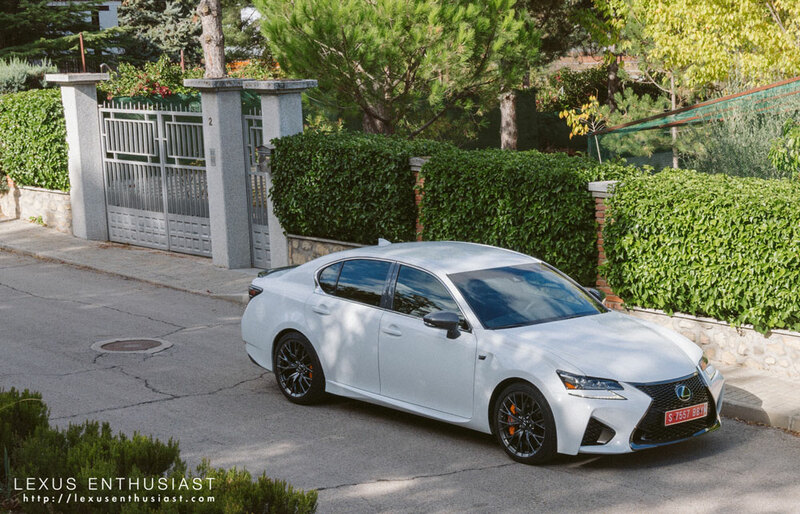 Lexus invited me to Madrid, Spain, to test drive the GS F on both street and track to find out for myself. 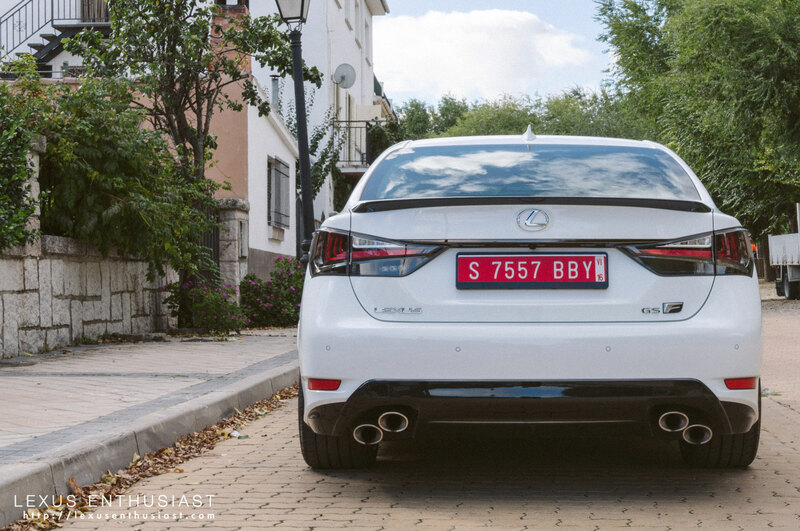 The days starts off in an Ultra White GS F, cruising the rural roads and highways to the northwest of Madrid. 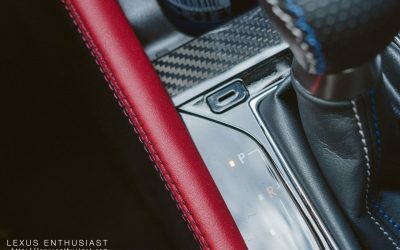 The lack of an adaptive variable suspension had me concerned about general road harshness, but Chief Engineer Yukihiko Yaguchi and his team have managed to balance the comfort necessary for every day driving with the edge expected from a high-performance vehicle. 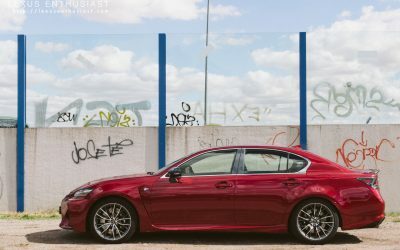 Over the course of my two hour route, the refinement of the GS F shines through. 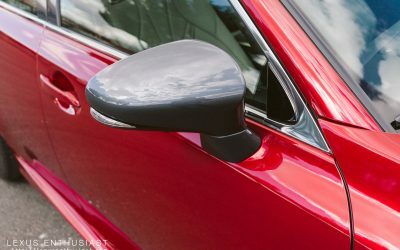 This is a car meant to be driven forever, eating up miles effortlessly. 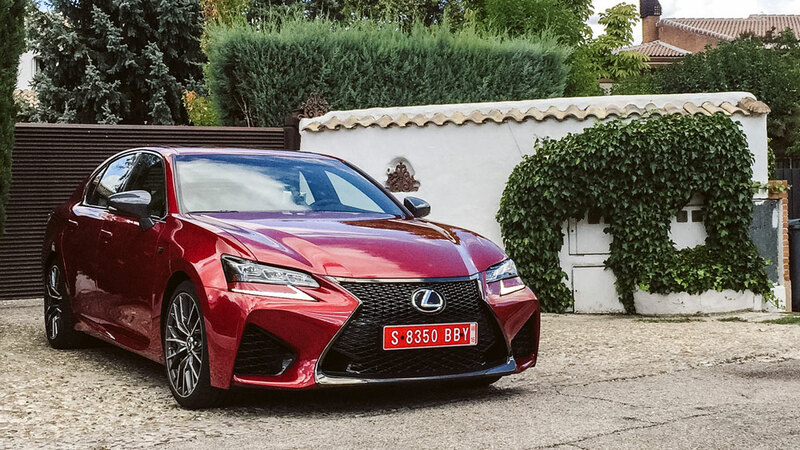 The only real problem is staying under the speed limit — exactly the type of challenge you want in a 467-horsepower sedan. 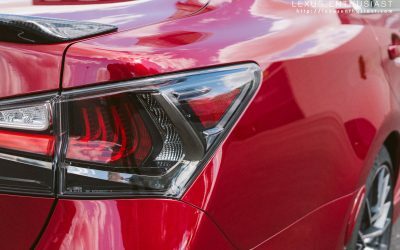 The triple-L headlights will be standard on all GS F models, and that’s a very good thing, as they bring a distinctive and premium look to the whole vehicle. 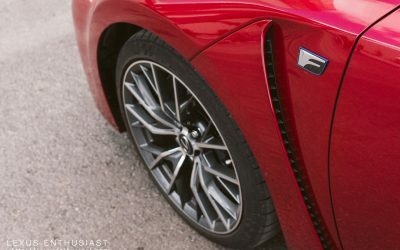 The way the daytime running lights hook into the main light casing is new for Lexus, and signals an evolution in their headlight design. 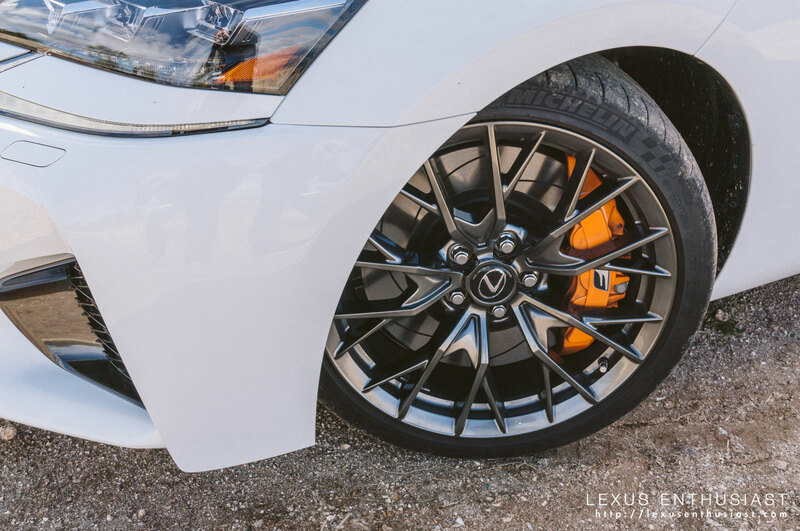 The Brembo brake setup is identical to the RC F: 14.96-inch (380mm) diameter x 1.34-inch (34mm) slotted discs with opposed 6-piston aluminum monoblock calipers on the front, and 13.58-inch (345mm) x 1.10-inch (28mm) discs with opposed 4-piston aluminum monoblock calipers on the rear wheels. 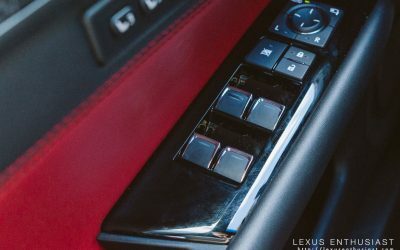 On the interior tech side of things, many of the features will be familiar — the 12.3″ central display, the F instrument panel, the Remote Touch controller, the Heads-Up Display, it’s all standard Lexus functionality. 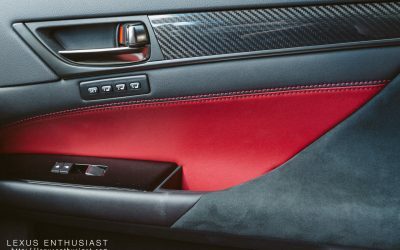 There are two audio systems available: a standard 12-speaker system with a 299 watt amplifier, and a 17-speaker Mark Levinson surround sound system with a 750 watt amplifier. 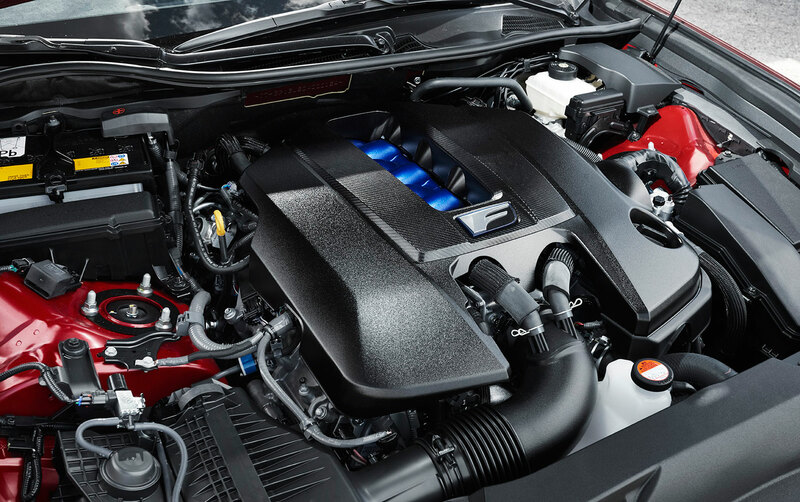 Let’s break down some of the more technical facts about the GS F — it’s powered by the same naturally aspirated 5.0L V8 engine found in the RC F, with identical specifications: 467 horsepower at 7,100 RPM, and 389 lb.-ft. of torque between 4,800 and 5,600 RPM. 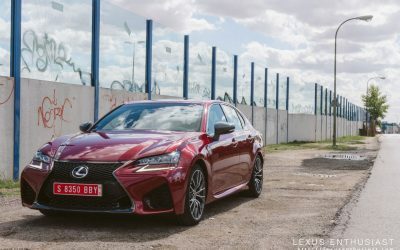 This results in a 0-60 time of 4.5 seconds and 1/4 mile acceleration of 12.8 seconds — just 0.2 seconds off both the RC F and the BMW M5 official times. 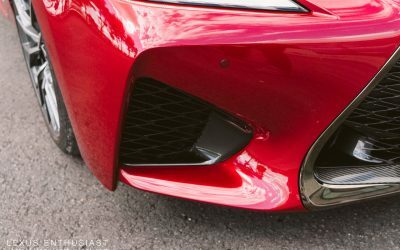 As mentioned previously, the GS F forgoes the Adaptive Variable Suspension for a more traditional double wishbone front/multi-link rear setup. 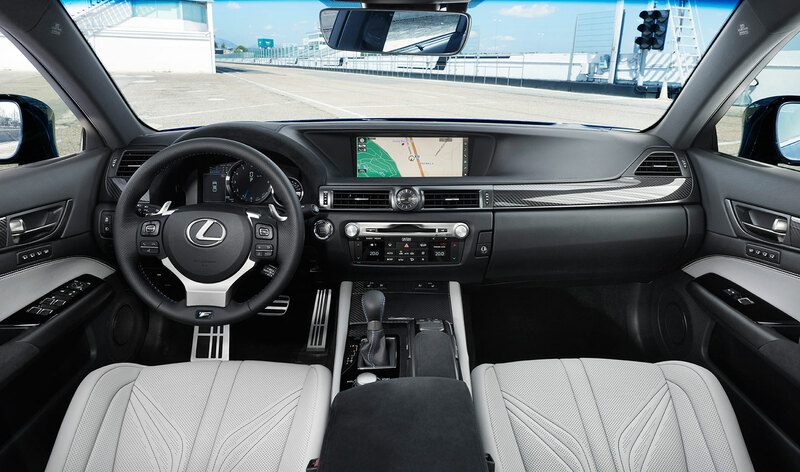 The chassis benefits from improvements made to the updated 2016 GS, with an additional 188 points of spot welding, 73 feet (22,500mm) of structural adhesive, and 132 additional laser screw welds. 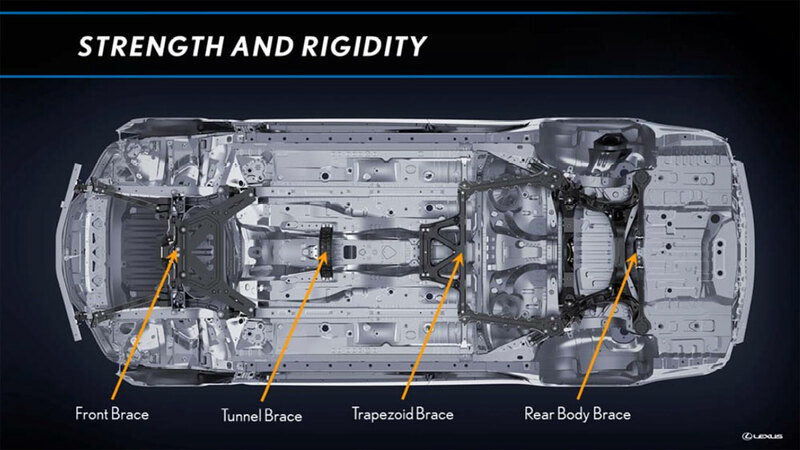 These are big numbers, and combined with four underbody braces, considerable improvements have been made to the overall rigidity of the GS F body. 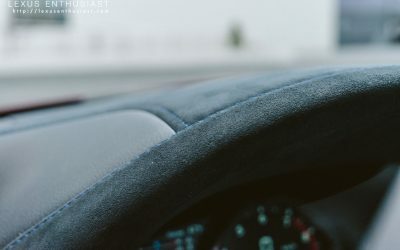 STANDARD: Baseline mode, meant for everyday driving. 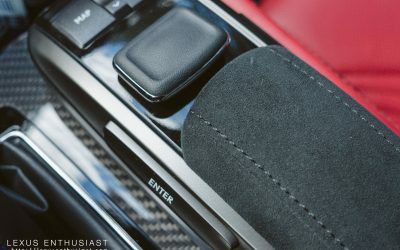 SLALOM: Additional emphasis on steering response. 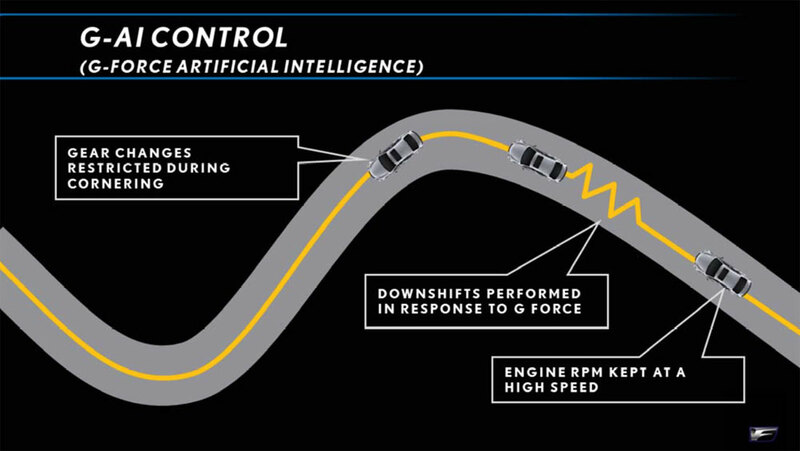 ￼￼￼￼TRACK: Helps provide added handling when driving at higher speed. 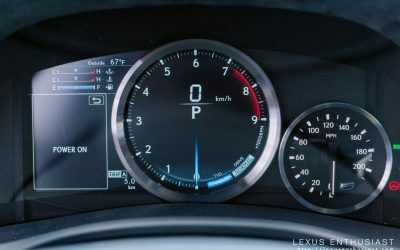 Finally, GS F fuel economy is estimated at 16 city/24 highway/19 combined, with a top speed of 168 mph (270 km/h). 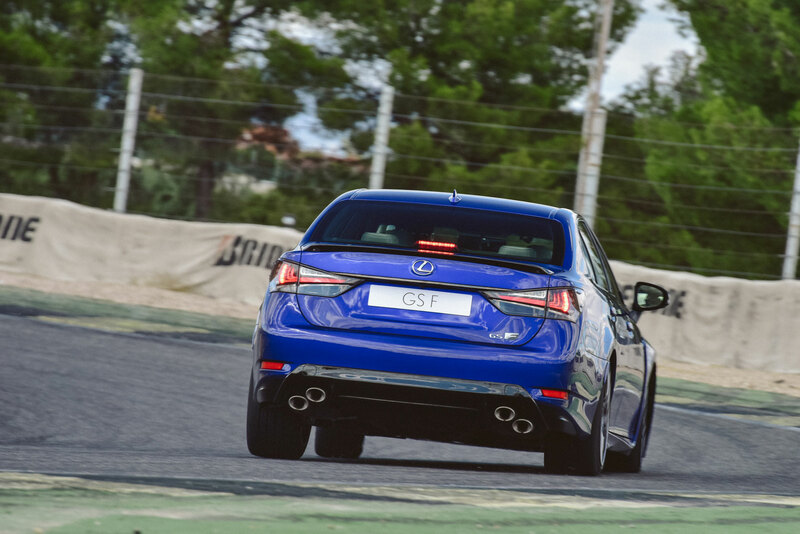 After lunch, it’s time for laps at Circuito del Jarama, a former F1 track just outside of Madrid. Built in 1967, it’s an old course with plenty of elevation changes and corners large and small — very challenging for someone that only gets track time a couple times a year. 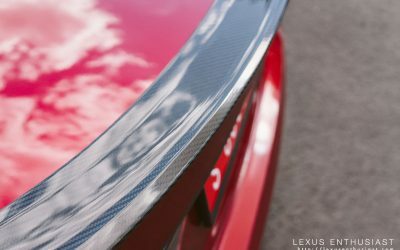 First up is the RC F, where a combination of nerves and unfamiliarity with the track had me fighting every corner. 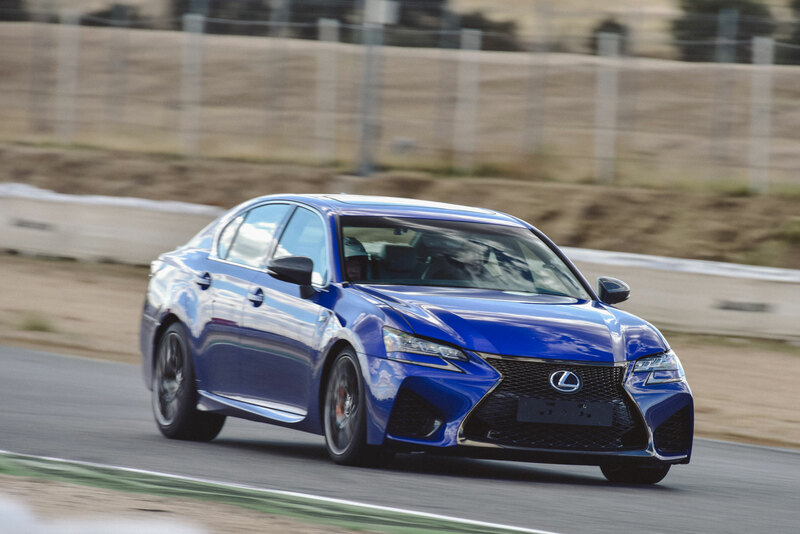 The RC F has this neat trick of augmenting the abilities of an average driver, but it requires a certain recklessness — six laps of Circuito del Jarama, and I was mentally exhausted. 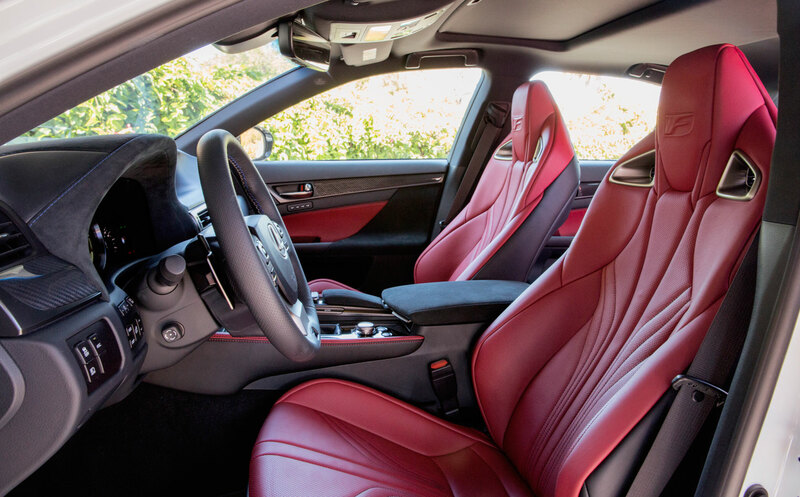 Moving into the GS F, there was an instant comfort right from the first corner. 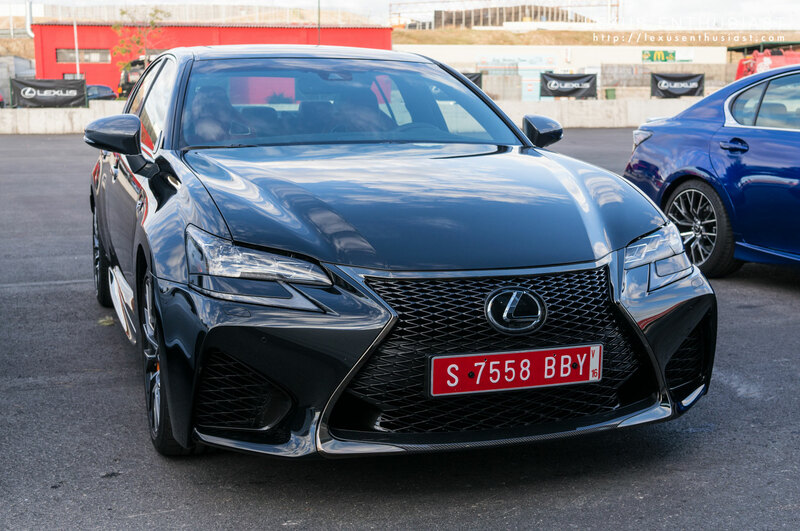 My personal driving style is more long-distance runner than sprinter, and I can think of no better metaphor to compare the RC F and GS F on the track. I could feel myself getting better on every lap, more awake, settling into my groove. 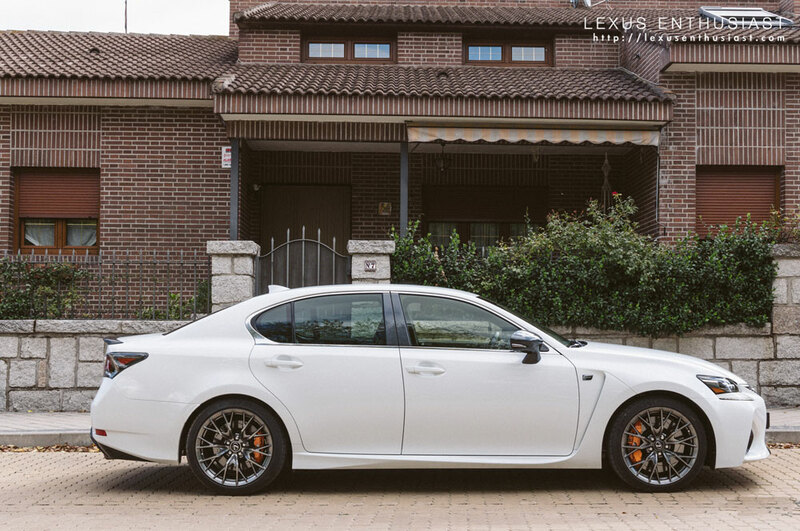 While the longer wheelbase had a great effect on overall stability, there’s a lightness of movement with the GS F — steering is precise but not heavy, the electronic power steering system detectable without being overbearing. 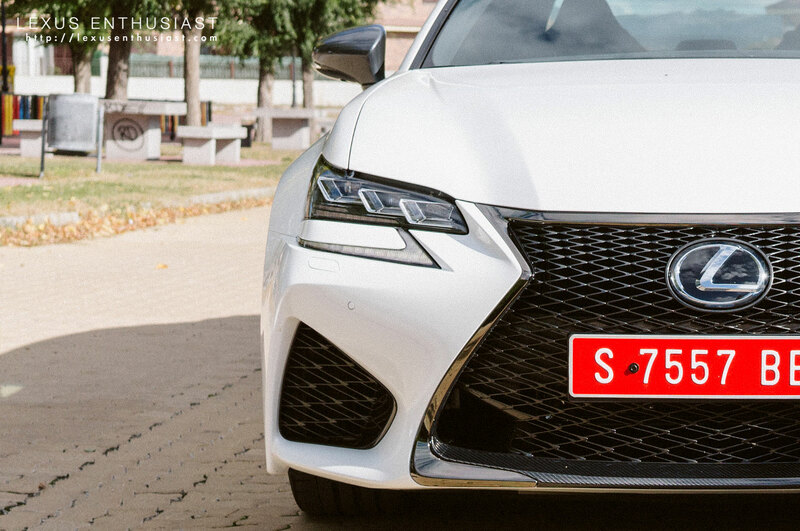 The variation in the GS F’s Drive Select modes — Normal, Sport S, and Sport S+ — can be felt on the road, but it’s on the track where minor differences become major changes. 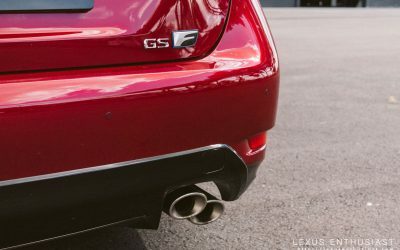 I start off driving the GS F in SPORT S+ mode and work my way down, and you can feel the electronics smoothing out the throttle and steering input. 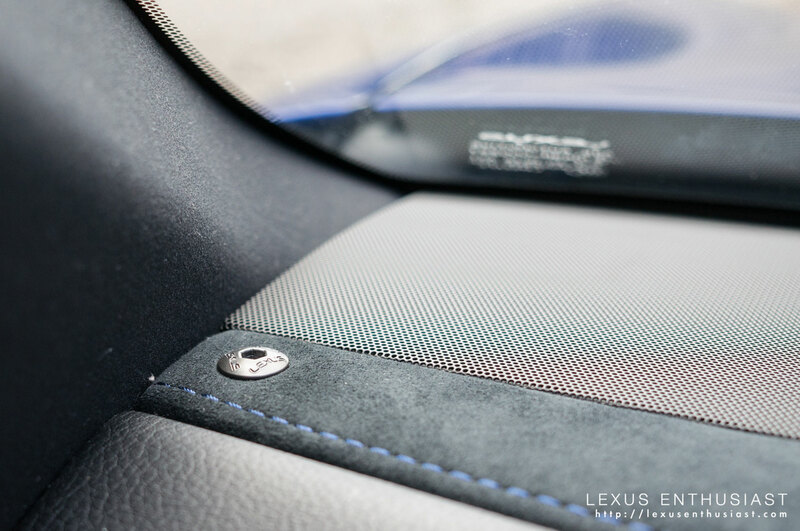 Installed on the GS F is Active Sound Control, which electronically synthesizes the engine sound and pipes it through two dedicated speakers. 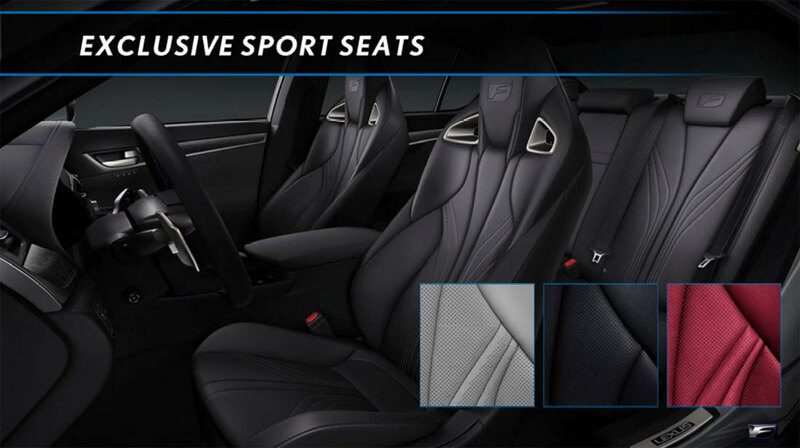 The system is only active in SPORT S & SPORT S+ mode, and on the road, it’s a welcome boost to the engine note. On the track though, Active Sound Control slips a little, unable to keep up with what’s happening. I found the mismatched sound a distraction, and was happy to learn there’s a switch to turn it off. 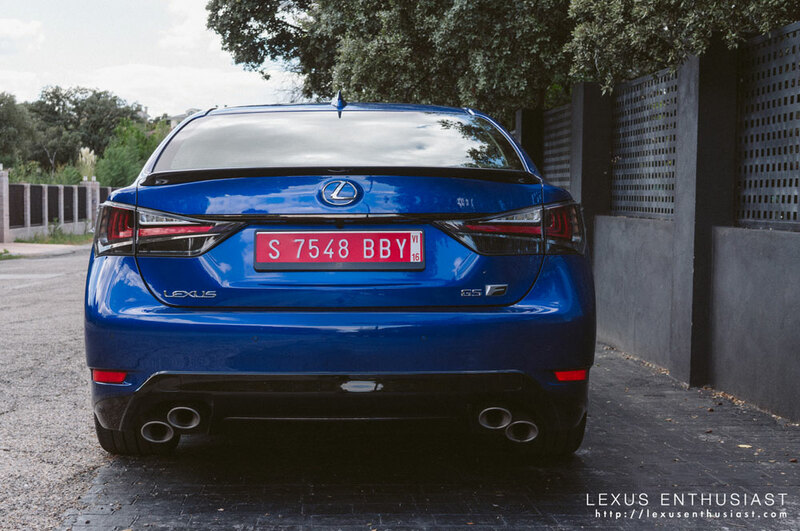 In the USA, the GS F will retail for $84,440 USD plus $940 delivery charge. 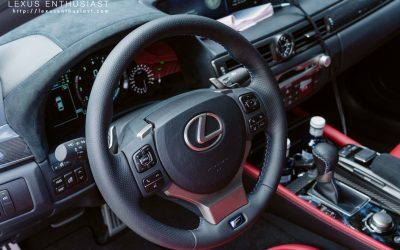 Nearly all the features outlined above are standard — in fact, there are only two options available: the orange brake calipers and the Mark Levinson 17-speaker sound system. 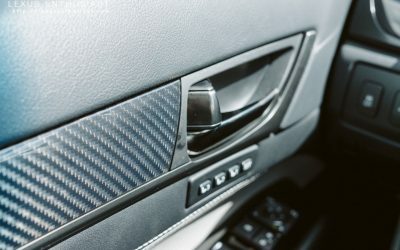 Pricing for the options has not yet been released. In the end, there is a sense of applied formula — take the core elements of the F brand, and fold them into the existing GS. 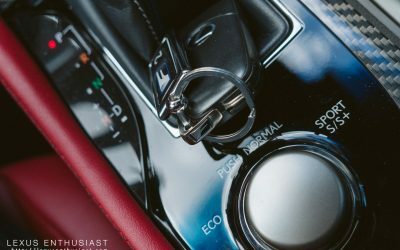 It would be easy to look down on this process, or to write it off as a shortcut, and yet it’s that now-standard package of F brand elements — the V8 engine, TVD, forged aluminum wheels, the sports seats, the suspension fine-tuning — that have transformed the GS into something much greater than the sum of its parts. 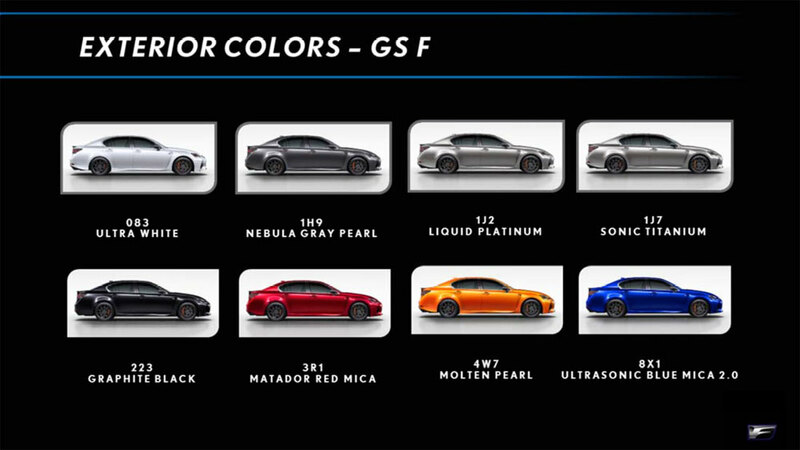 Hemi: I would go for Nebula Grey Pearl/Liquid Platinum/Sonic Titanium exterior and definitelly red interior.